Her big break came last fall when she appeared on the season premiere of Dragons' Den, walking away with a deal with Arlene Dickinson. 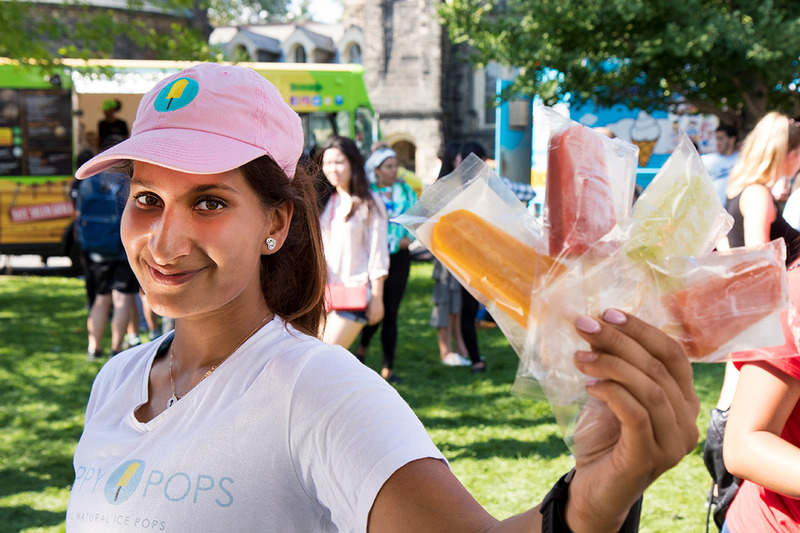 Fast-forward to today, she’s preparing to relaunch the brand and prove that ice pops can be more than a summertime treat. Shiz Aoki (above) and her team, which includes U of T computer science alumna Katya Stein and Ryan Marien, have built an Adobe Illustrator-like tool to help researchers in the life sciences sector visually depict their work. Aoki, a trained medical illustrator and a former lead illustrator for National Geographic, got the idea for BioRender after her Toronto studio was inundated with requests from local scientists who struggled to create quality graphics to accompany their presentations and journal submissions. “Some of these are Nobel-winning scientists who are making the front page of really prestigious science journals, but when you open it up and read the articles, the images that are supposed to capture that science are completely unstandardized, which is obviously an issue for educational purposes,” she told U of T News earlier this year. BioRender, which received support by ONRamp, is not only improving the look of researchers’ diagrams, but is helping to create a visual language to represent protein structures and chemical pathways. That could ultimately make it easier for researchers to communicate their work to the public and to each other, speeding up the pace of innovation and discovery. Conner Tidd (above) and Kevin Jakiela have a lofty goal: to get city dwellers growing their own fresh food, helping to save the planet in the process. The co-founders of Just Vertical, who both studied sustainability management at U of T Mississauga, sell an upright hydroponic growing system that can be parked in the corner of a kitchen and used to grow everything from leafy kale to fresh strawberries. The Aeva can grow over 70 plants and produce nearly five kilograms of fresh, pesticide-free food per month. For all the high-tech advances in medicine, sometimes it’s the simplest problems that prove hardest to solve – like getting health workers to wash their hands properly. That’s where the Fian Bar comes in. The device is mounted next to washroom sinks in hospitals and guides users through the various stages of handwashing using three different icons – water, soap and scrub. It also uses sensors to track which stage the user is in, illuminating the proper icon. “If the user washes their hands insufficiently, the entire device flashes and beeps,” co-founder Luke Kyne told U of T News earlier this year. Kyne said he and his fellow co-founders – Marawan Gamal, Parham Chinikar and Michael Wu – got the idea after learning Canada has the highest rate of health-care acquired infections of any developed country – and that about half of those infections can be traced to improper hand hygiene. As a hip hop dancer, U of T Scarborough’s Axel Villamil knew first-hand how cumbersome it was for choreographers to map out their routines using conventional methods: pen, paper and sometimes the odd stool or sneaker to stand in for a performer. He figured there must be a better way. So he teamed up with co-founder William Mak to build an app that allowed choreographers to map out their routines, with dots representing dancers, while taking into account the size and shape of the performance space – all in time to the music. The app is already being used by the Toronto Raptors and choreographers representing other big-name performers have expressed interest. “It was a dream of mine to do something with the NBA and I was too short to do basketball, so this should suffice,” Villamil told U of T News last year. As a researcher, Soror Sharifpoor was focused on heart-related technologies – and then a surgical oncologist came calling. The surgeon was looking for a material to immediately reconstruct the damaged tissue of his breast cancer patients during lumpectomy procedures. And, as luck would have it, Sharifpoor and her colleague Kyle Battiston had been working with a unique polymer in the lab of U of T Professor Paul Santerre that, with a few tweaks, fit the bill. The two ended up co-founding Polumiros, which is working toward getting the material approved through clinical trials. “The patients don’t have to go under the knife a second time,” said Sharifpoor, who completed her PhD at U of T in biomaterials and biomedical engineering and is now the research program manager at the Ted Rogers Centre for Heart Research's translational biology and engineering program. Pooja Viswanathan’s mission to improve the lives of wheelchair users began when she was an undergraduate student. That was when she visited a long-term care facility and was struck by the number of “slumped over” residents who had been stripped of their mobility and independence. She blamed a lack of wheelchair innovation over the past half century. So she set to work making an array of sensors that could be attached to any motorized wheelchair – not unlike the collision-avoidance sensors that now come standard on many automobiles. “You end up with a smart wheelchair that can detect obstacles,” Viswanathan, who did her post-doctoral research at U of T, said during a pitch competition last year. Viswanathan’s startup, Braze Mobility, says its sensor arrays are especially useful for wheelchair users who suffer from vision or hearing impairment, or who have upper body mobility issues. "Proteins make every process in your body happen, and drugs are these small molecules that have to bind to proteins,” Ali Punjani, the startup’s co-founder and CEO, told U of T News earlier this year. Field-programmable gate arrays, or FPGAs, are complicated pieces of hardware traditionally used to implement specialized functions like network switches, but are increasingly being deployed by cloud service providers. However, the challenges associated with designing hardware threaten to limit wider adoption – which is where LegUp Computing comes in. “LegUp allows software developers to leverage FPGA capabilities and eliminates the need for hardware-design skills,” Canis, LegUp’s CEO, explained to U of T Engineering last year. LegUp closed a seed round of funding last year that was led by Intel Capital. Awash in patient data, the health-care sector is poised to be transformed by AI technologies like machine learning – but there’s just one problem: Much of that data is walled off in silos, making it difficult to analyze effectively. Fortunately, Carolina Gomes and Daniel Zhang have a solution. Their startup, called Chopin, weaves together data from different silos using something called a knowledge web, while making it more accessible to front-end users. “We’re interested in hospitals that haven’t centralized their data or for which centralized data isn’t working – specifically mid-sized hospitals that don’t have a large budget,” Gomes told U of T News last year. Chopin, which got its name for the way the tool “orchestrates” data behind the scenes, is already field testing its tool at several local health-care institutions.